Awat Hassan talking to CPTers at his home, December 04, 2016. Photo by: Rezhiar Fakhir. 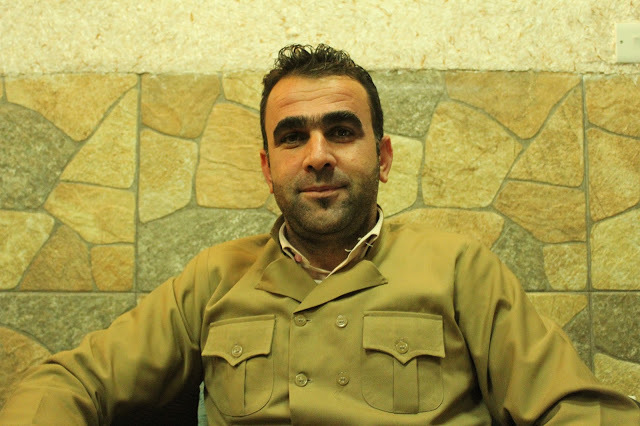 Awat Hassan Abdulla is a civil society activist and one of the main organizers of the teachers’ protests that are currently happening in the city of Sulaimani. Since the beginning of the school year in September 2016, the teachers are on a strike and demand that their full wages be paid and that the government sector will stop and deal with its internal corruption. The schools and universities remain closed until now. Christian Peacemaker Teams (CPT), an international human rights organization, have been in contact with Mr. Awat Hassan Abdulla and his family, who requested that we accompany them. Mr. Awat and his family have been receiving threats and following a series of violent detentions and beatings by the Security forces (Asaish), the last one took place on the 1 December 2016, he and his family fear for their safety and lives. CPT agreed to accompany him and his family.